This tool comes with ABSOLUTELY NO WARRANTY. USE IT AT YOUR OWN RiSK! 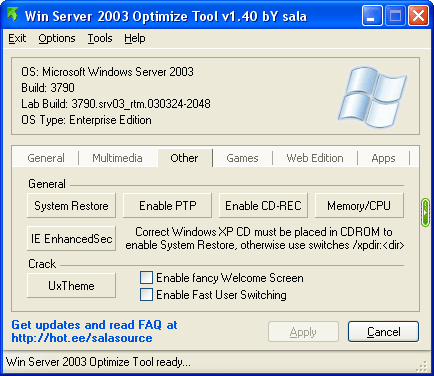 WHAT IS “Windows Server 2003 Optimize Tool” AND WHAT DOES IT DO? It starts and stops services with sc.exe and writes registry values (based on Group Policy script file system.adm). Optionally installs stuff from Windows XP CD (Windows Games and System Restore). Features that MAY be unsafe: System Restore (cause it is for Windows XP and not Windows Server 2003), uxtheme patches (because they are kind of hacks and I have not done yet original file restorer. For your know: uxtheme.bak is first backup and uxtheme.old is made if uxtheme.bak exists, if uxtheme.old exists the backup could not be done). 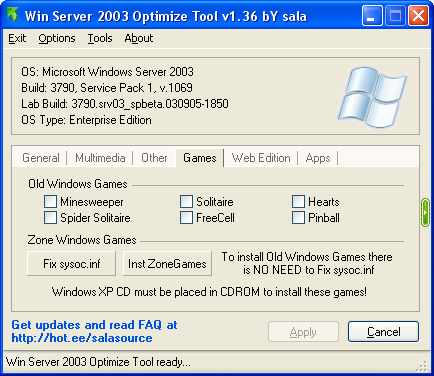 sysoc.inf fix for Windows XP zone games, it mess up Optional Component Manager (sysocmgr.exe) unattended installs by installing allways all Windows game components instade these that are included at unattended install file (msfn’s XP_Games.zip will end up same thing), thats why Fix sysoc.inf is disabled by default, if you want to take the risk use /gameforce switch. Yes, but some features are disabled (/giveall do not turn them on). IS NON ENGLISH VERSION OF WINDOWS SUPPORTED? I have not tested my tool additionally with non-english version of windows, so there is high probability that some features will not work 100% correctly. As I can decide from feedback it’s working well. I’VE TAKEN PIC RESOURCE ROOTS AND WHAT’S ALL IT ABOUT? There are 3rd-part tools with a readme, System Restore install script with SRService fix and uxtheme.dll’s. WHAT ABOUT THIS UNATTENDED MODE? By clicking Configure Skins for Logon Dialog you will see this window. Windows Classic theme is now restorable by using “Current skin configuration” to logon skin when your current skin is Windows Classic. For first time user it is recomended that you go trought HelpBar (ExplorerBar) guide. Acceleration button opens Display Properties last tab and gives instructions how to enable Display Acceleration. DirectX button opens DirectX Diagnostic Tool and gives instructions about DirectDraw and Direct3D acceleration. Enable Themes button enables and start’s theme service, Select Skin button open’s Display Properties theme tab and select’s default xp blue theme. Install Drivers button open’s Device Manager that you can make sure your sound card is correctly installed. Enable Audio button enables sound service and starts it. Maximize Quality button opens Sound and Audio Device Properties and gives instructions how to maximize sound quality. Volume Control button opens Volume Control that you can mute some unnecessary stuff. System Restore button installs system restore. XP cd must be in CDROM (if not then msgbox appears)(if you do not have correct XP cd, start this program by command line /xpdir:d:\windowsxpcddir where d:\windowsxpcddir is location of Windows XP CD files). netsvcs string SRService are added in sr.inf fix. rundll32.exe advpack.dll,LaunchINFSection sr.inf,DefaultInstall don’t work correctly (if you know why let me know) using 3-part inf install app and its work fully correct! Enable PTP button enables and starts image acquisition (stisvc) service. Enable CD-REC button enables and starts ImapiService service for cd recording. Memory/CPU button opens System Properties Advanced tab and gives instructions. IE EnhancedSec button disables Internet Enhanced Security. UxTheme button patches uxtheme.dll for windows xp, windows xp sp1, windows server 2003 final 3790, if you don’t have on of these error msgbox appeares. Installs Windows games, Windows XP CD required (if you do not have correct XP cd, start this program by command line /xpdir:d:\windowsxpcddir where d:\windowsxpcddir is location of Windows XP CD files)(all exe’s goes to system32 dir and chm+hlp goes to help, only pinball is installed windowsdir\pinball). Only for Web Edition and Small Business Edition. Use /forceweb if you need these options that are still not enabled. Stops and disables following services: HTTPFilter, IISADMIN, srvcsurg, appmgr, SMTPSVC, elementmgr and W3SVC. At Apps tab are links to useful drivers and apps. Tools menu include additional shortcuts to usefull tools.